Why did not Roxas project itself through Sora most of KH2 and Dream Drop Distance? This question tormented me for a long time. At the end of KH2 we see how Roxas quietly "exits" from Sora to talk with Namine. But at the same time he does not even make himself known before and after. For example, when Axel tried to return Roxas trying to harm Sora, he could also "get out" of Sora and say "What's with him all right". Or in DDD, he could help Sora and his friends. He has knowledge about the Organization 13 and he could share it. But he did not do any of this, how do you think why and why? Well, regarding the matter with Axel, I'd say he probably could manifest himself to others other than Sora only after their little bout at the Memory Skyscraper. In DDD, there was little he could've done: Sora was alone and falling prey of his own nightmares. Perhaps he might've even been afraid the Norts or something else could've gotten to him if he showed up. Look at what happened at Ven's armor. Also it's unclear how much he figured out about the Organization, he was aware of himself and how important of a piece he was, but I don't know about understanding Xehanort's plan. He probably just had a vague idea that whatever Xemnas wanted = danger and that even after KH II the threat was far from over. In kh2, there's a scene in the final mix version where the Organization comments that Axel's demise might be enough to shake up Roxas. That's why, immediately after, you see Roxas manifest and battle him under memory's skyscraper. When that's over, Roxas more-or-less accepts his place with Sora, and recompletes. Roxas isn't an independent force because he's now a part of Sora. Roxas kind of goes dormant in Sora once they merge at the start of KH2. He only kind of comes out in brief moments of strong emotional callbacks for Roxas, but only because Sora was subconsciously linked to Roxasâ€™s memories. While Roxas doesnâ€™t come out when Axel is dying, it is Axelâ€™s death that causes him to finally awaken and fight Sora. Once Roxas accepts Sora, he yet again falls dormant and only comes out in moments that would have an emotional connection to Roxas. In KH3D, he comes out briefly because Sora is in this messed up, multi-layered dream and it causes Sora to explore the â€œhurtâ€ in his heart from those he is connected to. With Roxas being one of those people who has â€œhurtâ€, Sora explores that pain in the darkness of his heart and causes him to face Roxas. Roxas is still dormant in Sora for all of these game. He canâ€™t materialize himself or really exchange information with Sora without an emotional link or for Sora himself to reach out, at least this is what we can discern from how Roxasâ€™ appearances have been. Was about to write a sort of essay-explanation about it but I see Dandelion and Spockanort already did that, so I'll keep it short this time. The main reason is that most of the time Roxas is actually asleep/dormant inside Sora, Xemnas even mentions that something truly emotionally impacting had to happen to awake him within Sora. It is also seen with the Org members during KH 2 always addressing Sora as Roxas. That wasn't all just mockery, they tried to shake Roxas awake within Sora's heart. In addition to the other factors addressed, I always thought the framing of the scene indicated that the outward projections of Roxas and Namine were a result of Sora's and Kairi's hearts interacting, and that's reinforced during the last scene when Sora reunites with Kairi on DI and we're shown a glimpse of Roxas and Namine smiling at each other. Roxas even says something to that effect, talking about how he and Namine are connected through Sora and Kairi; so his appearance there isn't arbitrary, but a product of the intimate link between Sora and Kairi which allows them to reach one another on that deeper level. Then how to explain the moment where Roxas "left" Sora? Does it mean that after the death of Axel, he did not sleep at least until the events of DDD? And yes, when Roxas came to talk to Namine, he was transparent, but when Roxas came to fight with Sora in "The World that Never Was," he even left the portal of darkness, if this was an illusion, why was he seen by Donald and Goofy? (It seems they saw him as far as I remember?) 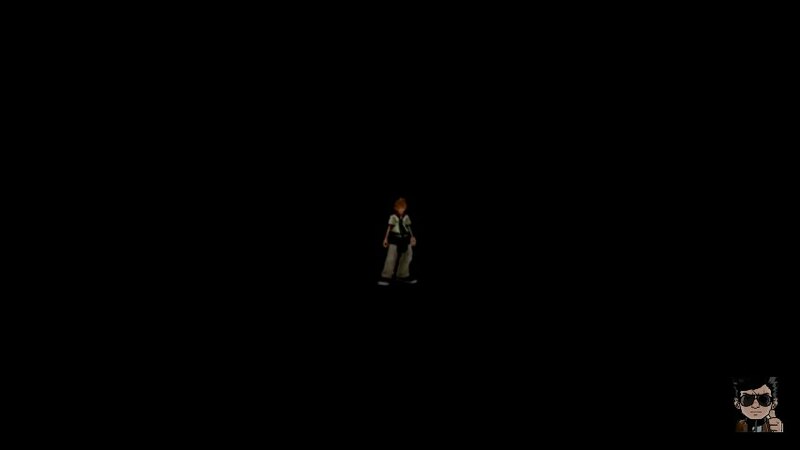 Well, this frame from the game is very interesting, here Roxas calls Sora while in some dark place. Does it mean that he did not "fall asleep" immediately and was conscious for a while, since he could call Sora? 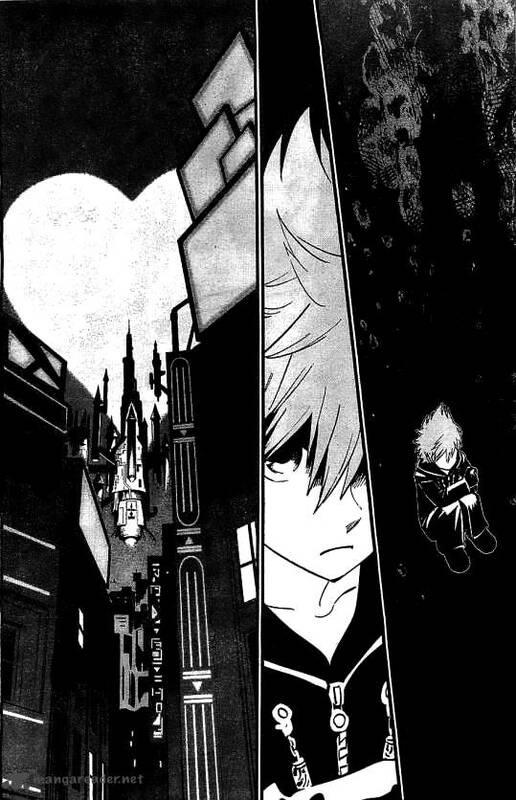 A similar place is in the manga where Roxas is no longer asleep. I apologize in advance, I do not know how to hide the image under "Spoiler". The fight that Roxas/Sora had in TWTNW was just inside of Sora's heart (as it was on his Station). He didn't actually "leave" Sora, just manifested to him. Donald and Goofy did not see him; Samurai Nobodies appear, time freezes, and they go to the Station. After the fight, Sora asks what happened, and they explain that he disappeared and they were fighting Nobodies that had showed up in the meantime. This is a purely metaphysical fight. Organization XIII's Number XIII, a Keyblade wielder and denizen of darkness. He vanished with a satisfied look after battling Soraâ€”but Sora was the only one who could see him in the first place. The scene where Roxas/Namine fade back into Sora/Kairi is where they both are fully "merged" with their Others. DDD revealed that he has his own heart so he's just asleep inside him again, alongside Xion and Ven, waiting to be restored and truly become his own person. Where they are as of DDD and at the start of KH3. Sora was only able to see Roxas (and Xion!) in DDD because he was asleep himself, and as others have mentioned, emotional impact was important to all his appearances. The Heart Hotel residents are aware of what's going on (and in Ven's case, can actually help him when he gave his armor, but this was again inside Sora's heart). They can interact with his heart but not the physical world. As of the Monsters Inc. trailer, Ven is the only one who actually talks through Sora. But that's also much different then Roxas or Ven taking over Sora's body to fight, or projecting themselves to the others, and we don't know how things will change within KH3. Well, this frame from the game is very interesting, here Roxas calls Sora while in some dark place. Does it mean that he did not "fall asleep" immediately and was conscious for a while, since he could call Sora? A similar place is in the manga where Roxas is no longer asleep. This is right when Sora is waking up and Roxas is merging with him. So this would be when he goes dormant. Even though he's aware, he's still dormant and can only "act out" for things that are emotionally impactful to him. Like saying goodbye to HPO or Axel's death. In addition to racconscity's explanation which is right on the spot, take a look at the final scene between Axel and Roxas after his fight with Sora. There Axel outright states that soon Roxas will go to sleep and they won't be able to talk anymore. The time Roxas is actually fully awake inside Sora is rather short overall, with a small bit shortly after their actual merge when Sora cries before entering Yen Sid's train and then near the end after Axel's death until Sora's return to Destiny Islands. Other instances are Sora subconsciously feeling the presence of Roxas' heart, not Roxas himself actually doing anything. In Dream Drop Distance anything involving Roxas also takes place inside a dream so there's no true "awakeness" from his side either. Does Namine and Xion also be considered asleep? It turns out Xion "fell asleep" after the battle Roxas and Riku? Also an interesting point. I always thought that Namine was part of Kairi only after talking with Roxas, but how much I understood at the time Namine opened the portal of darkness to help SRK return to their homeworld, has it already merged with Kairi? Does Namine and Xion also be considered asleep? Yes. Xion is alongside Ven and Roxas in Sora's heart, who are also asleep, and we also are only able to see her in the Realm of Sleep. She would have also fallen asleep a little earlier, during her actual death scene. We don't specifically see Namine in DDD or any mention, but her situation is the same as Roxas', except she's in Kairi's heart. She'll need to be saved alongside Roxas and Xion to become her own person. I always thought that Namine was part of Kairi only after talking with Roxas, but how much I understood at the time Namine opened the portal of darkness to help SRK return to their homeworld, has it already merged with Kairi? It's actually kind of nebulous. Every time we see Namine in TWTNW, she's fading away/distorted, so I guess you could make the argument that it happened anytime after Namine helps Kairi out of her cell. Although I think this is moreso about Namine being near Kairi, and we don't know if this would have happened to Sora and Roxas as well had they met. But the scene at the end (after opening the portal) would be the official moment that they both have returned to Kairi/Sora. Doesn't help that the series kinda stopped caring about NaminÃ© as a person after the Roxas prologue. Anytime she reappears she's basically an ex machina to propel the plot forward ("propel" might be a tad excessive). Like, it has only been explicit that they want to thank her. At this point I'm imagining a Kingdom Hearts mystical portal that will make every Nobody and Replica a real person, and Sora just saying "thank you" to NaminÃ© before This is Sparta kicking her back into it. Indeed, for a while NaminÃ© was Ms. Info-dump until that role got given to Yen Sid, Ienzo and partially Young Xehanort in DDD. There is a reference to her personal feelings here and there, mainly during the regular ending of Re: Coded, but it is never more than that. Heck, many people tend to forget that NaminÃ© is one of the suffering people too and that the bad things she did still somehow haunt her despite they happening almost all because other people forced her into doing it. The whole "Thank you"-business is just the tip of the iceberg and played up by the series as the important thing (for Sora) when it comes to her while the truly important bits are shoved aside, like i.e. - NaminÃ©'s feelings of guilt relating to her conviction that she doesn't want to be her full own person since she thinks she doesn't deserve it. - feelings of loneliness and just wanting a friend. - the more wholesome promise she made with Sora about being friends for real once they meet again made in CoM. It's much more complex than just the mere "Thank you" stuff and just by looking at her alone I already see just how much KH III has on its plate. Other characters minor and major alike have similar unresolved things and setups so I'd say there's enough stuff to address even without all the additional unnecessary Chi-baggage thrown in.